Gearshift cables transmit forces from the gear shift lever to the transmission. As soon as a gear is selected or changed by the driver, the gearshift cable transmits this mechanical impulse to the transmission. Tensile forces of up to 7 kilo Newton are transmitted over distances of sometimes up to more than 4 metres. The range of the DT® Spare Parts brand contains over 30 different gearshift cables suitable for various vehicle models. The cables are available in two versions. One version is intended for use in the linear track (grey marking). The other version is meant for the laterial track (black marking). For each version several variants are existing, which differ from each other in length and in the position of the end pieces. 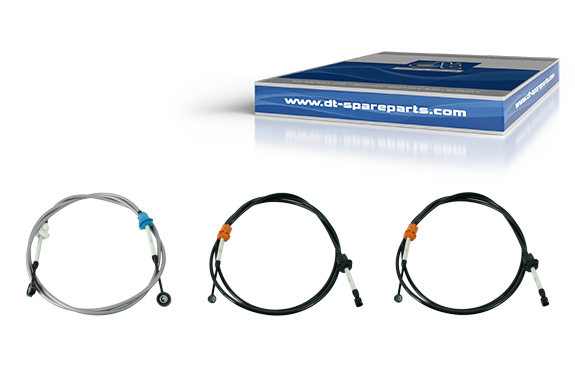 Gearshift cables of the DT® Spare Parts brand consist of numerous, precisely coordinated components. By maintaining close tolerances for each component, the perfect function of the gearshift cable is guaranteed. An essential part of quality control is the verification of compliance with the tensile strength. The optimal sliding contact between wire core and sheathing ensures extremely smooth running. The perfect functioning is supported by the use of a special oil directly on the wire mesh of the gearshift cable. The length of the gearshift cable must comply with the specifications of the vehicle manufacturer, to avoid tearing, breaking or canting. To facilitate installation, the cable ends and the sheathing are marked with different colours. This enables the selection of a suitable gearshift cable. Please refer to the installation instructions supplied with the product to ensure proper laying and fixing of the complete gearshift cable inside the vehicle.